Meet Martha, a twelve-year-old girl who lives on a plantation in Missouri. Hearing stories of the treasures found across the country, Martha’s father decides to sell their Missouri plantation and move to California. 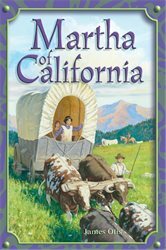 Your child will get a first-hand look at westward expansion as Martha tells how she lives in a covered wagon and overcomes obstacles while traveling on the prairie. By following Martha and her wagon adventures, your child will learn that God will always be with him. Historical fiction written by James Otis. 144 pages. Digital Edition available. Gr. 4–6.